This listing includes the original game CDs. Online help is available within the game. The box is pictured for reference and is not included. I will also provide a compatibility CD that will allow the game to run under ALL VERSIONS of Windows 10, 8, 7, Vista and XP, both 32 and 64 bit. Note that microphone recognition does not work. You have just been initiated as a man, a warrior. Join the Klingon forces with Gowron, head of the Klingon High Council. Investigate your father's death in this full motion video adventure game. You are Pok, son of Torghn and K'Tar, and you must point-and-click your way through the mystery surrounding your fathers murder. There is some scratchiness and graininess to the film, but that can be ignored because of its good plot and funny dialogue. The filming was directed by Jonathan Frakes who played Commander Riker on Star Trek the Next Generation. The directorial quality is just as good as the movie he directed, Star Trek: First Contact. Which makes it about equal to a regular Star Trek show, and its just as fun. 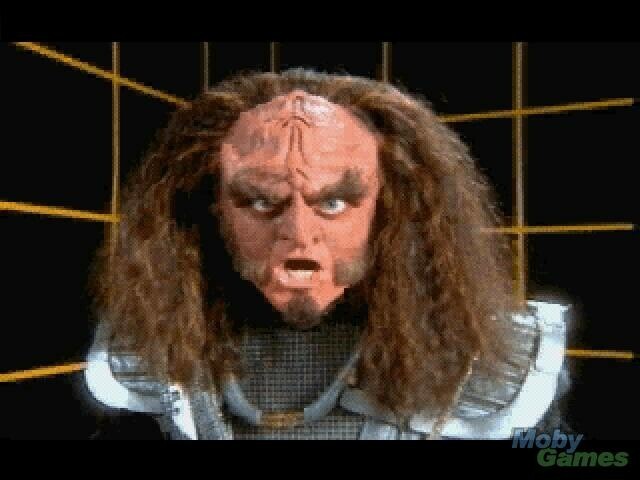 Although Star Trek: Klingon doesn't boast any of Star Trek's regular actors, it does include Gowron who periodically appears. You may remember him from his buggy, bulging eyes and the intriguing use of his eyebrows. The other part of this title is the interactive Klingon Language Lab. If you need to look up a Klingon insult, it's just a click away. How about a word to call your little brother? 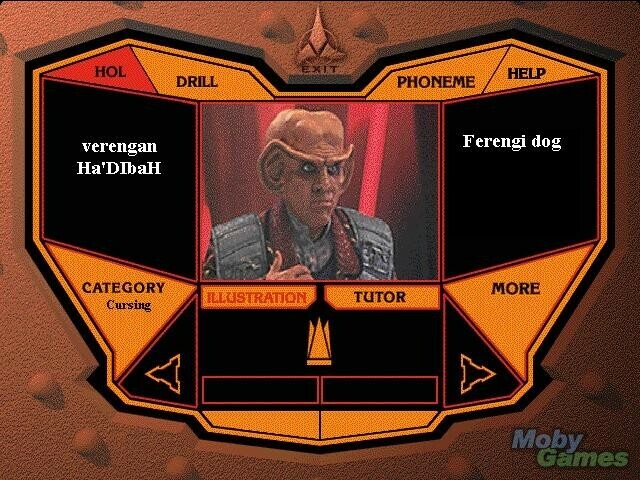 Try "veregan Ha'DIbaH": a Ferengi dog. Can't pronounce it? Just click on Tutor and Gowron will say it. Follow his lips and learn to speak Klingon! It uses a Klingon computer interface that comes complete with the actual computer bleeps and bloops heard on the TV show. Study hard, because there are also tests and quizzes, I'll bet you wish you took this course instead of Spanish in high school. At any point during the game you can double-click and stop the film on its current frame. You will be presented with a cursor that spins around, and when you move it over something that is identifiable by the computer, it will tell you all about the item. This is vital to playing the game, for when you are asked to bring the worms over to eat (in Klingon), you'd better not grab the blood wine by mistake! There are other parts when the action stops where you must make a decision, either by clicking on something or just waiting and trying to see what happens. Depending on your decisions, you'll either show that you are a true Klingon warrior, or if you're just Human slime.